Having a wide choice of guides can be valuable, particullary when using a pattern to trim material to size. In today's tip we will use three different guides to reduce the material to the finished size. 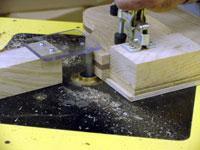 Normally we would band-saw the material to within 1/8" of the finished size and do one pass. 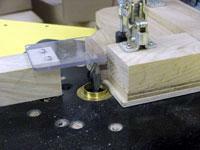 With three guides we do not have to be so fussy with the bandsaw and the final 1/16" pass reduces any tear-out. The six table leg feet are 1 1/4" thick each (2 pieces of 1/2" oak and 1 piece of 1/4" walnut). A 1/2" spiral bit and three guides (1 1/8", 1", and 15/16") will be used. A 1 1/2" high fence with a bit guard is clamped over the bit when cutting. 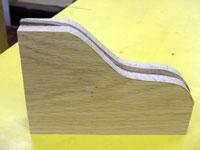 The foot pattern is made from 1/4" MDF. The foot material is glued together and trimmed to rough size with a band saw. 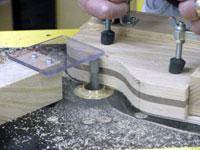 The back and bottom of the foot must be square before being put in the holding jig. 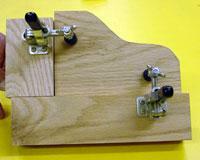 Use two hold down clamps to hold the material firmly in the jig. Start with the 1 1/8" guide and trim the widest material first from all six feet. Move to the 1" guide and finish with the 15/16" guide. To make the feet even smaller, reduce the guide size.